Have you always been interested in sculpture, but haven’t been sure exactly where you should start? It’s all in the tools. 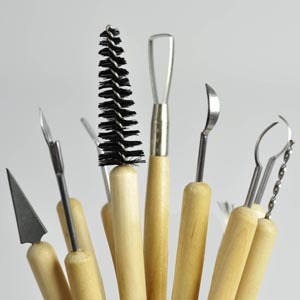 Sculpting tools are the key ingredient to providing you with the best sculpting experience, no matter your skill level. Technique comes with time and patience, but when using sculpting tools of low quality, most artists find that a lot of their time goes to controlling their tool rather than their art. What Are the Best Sculpting Tools? As with any product on the consumer market, there are a lot of high quality and a lot of low quality products, at every price point. Often, sculpting tools go the way of the latter, which can be attributed to tool makers overlooking the need for well-made detailing modelling tools. As with any handcraft that requires meticulous attention, sculpting is special, as good work can simply not be achieved without good tools. It’s important to choose a supplier that curates a selection of high quality, well made stainless steel and silicone clay tools for detail sculpting of soft modelling materials. Specialised stores are the best for this, as they often sell directly to the artists and retailers worldwide. Dalchem is a specialist Melbourne supplier of sculpting tools and materials that are used by hobbyists and household businesses alike. Some of the world’s leading manufacturers rely on Dalchem as a supply partner. Our prices are competitive and reasonable, and we strive to provide you with the service and quality you require. Our buyers purchase products that save sculptors time so they can devote their attention to their creativity instead of controlling their tool. Our most recommended sculpting tools are especially designed for sculpting soft modelling material, with their rounded and smoothed edges and no sharp corners or points. Ready to start creating? Our customer service representatives would love to chat with you. Contact us today and we will be with you shortly.